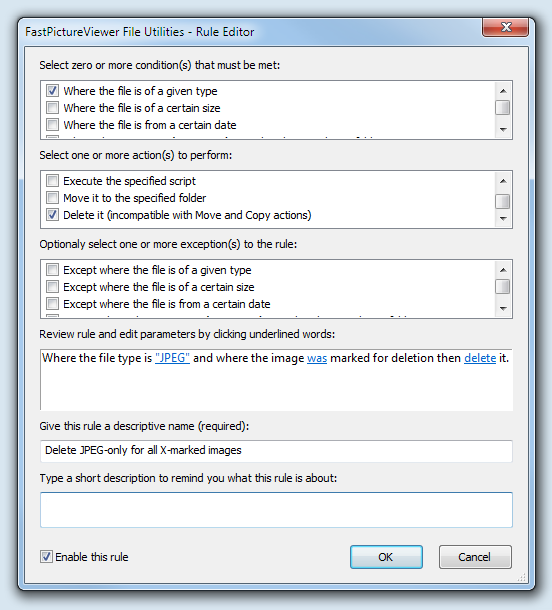 FastPictureViewer | View topic - How to: Delete only the JPEG (or the raw) in JPEG+RAW mode? A question was asked on the support email regarding the possibility to delete only the JPEG (or only the raw) in JPEG+RAW scenarios. FastPictureViewer Professional’s delete functions only allows deletion of the entire JPEG+RAW stack upon pressing the Delete key, or through the batch delete function (X and Ctrl+X). However if your workflow implies deleting the raw sometimes and the jpeg some other times, for whatever reasons, you can use the rating system and tag the images in question according to what you want to do with them. Just create your own arbitrary convention like 1-star = keep jpeg, 2-stars = keep raw, then build deletion rules for the batch processor (F key) to delete the raw file for all 1-starred and the JPEG file for all 2-starred images. The rules can also delete the XMP sidecars that may have been created when rating the files. This is really easy to do and only takes a couple of minutes to set up once and for all. Once the rules are built you can apply them to all images in just one click when you are done with the reviewing, and the batch processor with do its duty in a few seconds. Screenthot of the rule editor with a "Delete JPEG when the image was X-marked" rule displayed. A similar rule can be created to delete the non-JPEG when the Publish flag is set. If you are already using the stars (XMP rating) for their intended purpose, you can use the XMP Label or the Photoshop Urgency to build your convention: perhaps a Red label would mean to keep the raw file while a Blue label would mean to keep the JPEG, or anything else that suits you. The batch processor can also act on files according to the transient “mark for deletion” flag (X) and “publish” flag (P), if you don’t want to create XMP sidecars or already use the three XMP flags for other purposes. For example use the X key as a marker to tag the images for raw deletion, and the P key to tag the images for JPEG deletion, and build corresponding rules for the batch file processor. The only thing to remember is that transient flags (X and P) are forgotten when you exit the program so you have to remember to apply the rules before quitting, while the other three XMP flags (Rating, Label and Urgency) stick with the images across viewing sessions. A tutorial on the batch processor can be found here on the help and tutorials page.